LONDON (7 Dec. 2018) – As part of ongoing efforts to combat illegal wildlife trade in the Horn of Africa, Dr Laurie Marker, Cheetah Conservation Fund (CCF) Founder and Executive Director, and Patricia Tricorache, CCF’s Assistant Director of Illegal Wildlife Trade, took part in a panel discussion at the House of Commons in London on 3rd December 2018. The event, Somaliland Beyond Drought: Saving Wildlife and Protecting the Environment, was hosted by Zac Goldsmith MP and Somaliland’s Mission to the UK and the Commonwealth. In addition to HE Shukri Haji Ismail Bandare, Somaliland’s Minister for Environment and Rural Development (MOERD), Somaliland panellists included Dr Edna Adan Ismail, Director of the Edna Adan Hospital, a non-profit facility that provides healthcare and training, and former Minister of Foreign Affairs (2003-2006). “Few people realise that most cheetah stolen from the wild to be sold as pets are at best, a loss for conservation; at worst, likely to die. In addition, wildlife trafficking robs communities of their resources and welfare, since illicit activities breed unsafety, which in turn affects a community’s ability to engage in activities such as eco-tourism”, said Dr Marker. “This event allowed us to raise awareness about these issues and others, including the importance of proper rangeland management and integrated livestock-wildlife management in arid landscapes”. During her opening remarks, Minister Shukri described the effects of a cyclic recurrence of natural disasters on Somaliland, such as droughts and cyclones, which has left thousands of people internally displaced. Compounded to this, Somaliland has seen a significant increase in the illegal taking of wildlife for the pet trade in the Gulf States during the last 10 years. Despite all odds, including lack of international recognition as an independent nation, Somaliland has been at the forefront of tackling these issues with a focus on putting an end to the illegal wildlife trade by taking a strong stance in prosecuting those involved. Because of the achievements of this small country that he described as a ‘beacon of hope’ in Africa, Goldsmith has taken an interest in exploring measures that can improve the situation for the country. CCF began fighting the illegal cheetah trade in 2005 and has compiled cases of trafficking of live cheetah or cheetah products through research and direct reports from around the world. It works closely with law enforcement, government and NGOs in Somaliland and internationally to promote efforts that will lead to the confiscation of trafficked cheetahs and the prosecution of poachers. CCF also has a Somaliland-based team currently caring for 12 cheetahs confiscated during the last two years, among other species. Most of these animals are destined to spend the rest of their lives in captivity as they were taken from the wild at such young ages that they lack the skills to survive on their own. In 2011, CCF began building a network in Somaliland and establishing working relationships with local government authorities. CCF works with Minister Shukri and a group of NGOs and academic institutions to develop strategies aimed at improving enforcement and educating the public on the legal and human aspects of wildlife trafficking. In early 2018, two wildlife officers with the Somaliland MOERD travelled to Namibia to attend a CCF-sponsored conference exploring the human dimensions of natural resource management, Pathways Africa, and later to CCF’s Centre for training in the handling of confiscated animals. On 28 August, Somaliland achieved a landmark victory in court when two subjects charged with wildlife trafficking were sentenced to three years in prison and a fine of U.S.$300 – the first successful conviction of cheetah traffickers in Somaliland. “CCF also supports the government with the placement and care of confiscated cheetahs. We have travelled to Hargeisa to look after very sick cubs and help train staff in veterinary care. 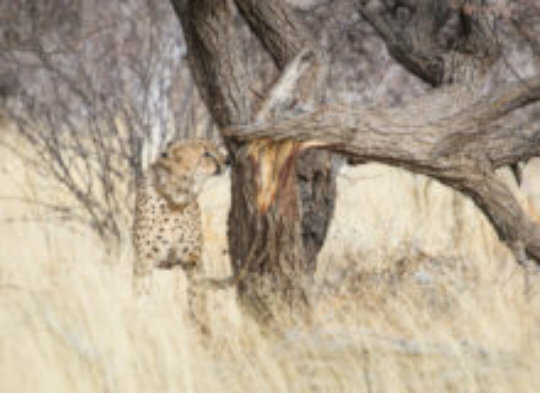 Unfortunately, Somaliland lacks the proper infrastructure to care for wildlife; over the last seven years authorities have confiscated 53 cheetahs, and some did not survive due to malnutrition and disease. To address this, we recently began a programme to build capacity for wildlife veterinary services that we hope will also awaken an interest in working with wildlife among students and youth”, said Patricia Tricorache. There are less than 7,500 cheetahs left in the wild. Since 2005, CCF has recorded nearly 700 cheetahs and cubs taken for the illegal pet trade and smuggled through the Horn of Africa, mostly through Somaliland, to the Middle East. Less than 20% of these are known to have survived. Most smuggling goes undetected, however, so actual numbers are believed to be much higher. “Not only does trafficking impact cheetahs, but the same people that smuggle cheetahs are also suspected of trafficking humans, drugs and other wildlife products. This is the first time a meeting like this has taken place. We need more opportunities like this to share ideas on how to stop the poachers and reduce demand, before even more harm is done”, said Dr Marker. 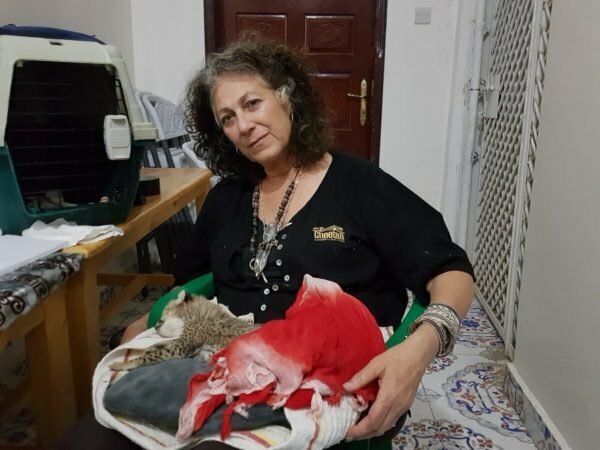 Click the link below to Watch Dr. Laurie Marker in Somaliland with two confincated cheetah cubs. On September 30, 2018, we had to say goodbye to one of our beloved livestock guarding dogs, Spots. Spots was the star of CCF, modeling for photos, taking part in films, and working extremely hard to protect his herd of goats and sheep. On the morning of September 30, 2018, he had to run at top speed to get to his herd and follow them for the day, but unfortunately, we believe his heart gave out by the time he reached them. Spots was becoming an old man at the age of 10 and began showing his age, but he still loved working more than anything in the world. Every Sunday he was super excited to go out with his herd and while we are incredibly sad that he has passed away, it is some consolation that he died doing what he loved best. 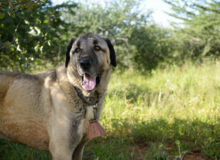 Spots was part of CCF's renowned Livestock Guarding Dog Program that has been highly effective at reducing predation rates and thereby reducing the inclination by farmers to trap or shoot cheetahs. 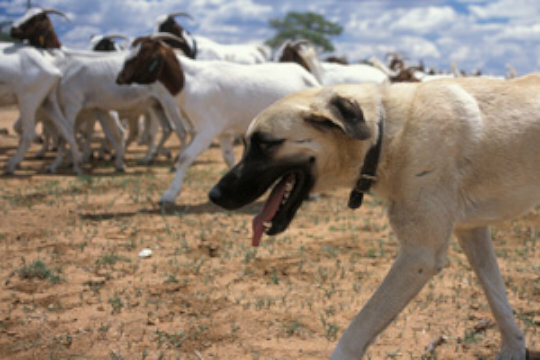 CCF’s renowned Livestock Guarding Dog Program has been highly effective at reducing predation rates and thereby reducing the inclination by farmers to trap or shoot cheetahs. CCF breeds Anatolian shepherd and Kangal dogs, breeds that for millennia have guarded small livestock against wolves and bears in Turkey. The dogs are placed with Namibian farmers as puppies. They bond with the herd and use their imposing presence and loud bark to scare away potential predators. CCF has been placing dogs since 1994 and our research shows that dogs are highly effective, reducing livestock loss from all predators by over 80 and up to 100 percent. Farmers adopt CCF dogs and participate in education on how to train the dog. CCF does on site follow up visits to ensure the dogs have proper training and medical care and are settling into their guardian role. Farmers have enthusiastically embraced the program, and there is now a two-year waiting list for puppies, which makes these dog's role even more important to CCF's Livestock Guarding Dog Breeding Program. Thank you Spots for giving CCF so many years of your life and being the best working dog ever and the gentlest soul we know! We will miss you, but will always remember the star of our program. Rest in peace our strong guardian. On 26 October 2018 CCF released a single male cheetah into Erindi Private Game Reserve. This cheetah, named Miers, was rescued by CCF this past May after he had been captured for reportedly killing livestock. While CCF was told that the cheetah had been in captivity for only a short period of time, we believe that he had been kept for much longer as he was very habituated to people. After a couple months of rehabilitation at CCF headquarters, Miers was transported to Erindi in August with seven other cheetahs to begin preparation for release. Because Miers became very habituated to people and human activity, he was not a suitable candidate for release into an open system (like CCF’s property) where he could potentially come into conflict with livestock or people. Fortunately, CCF was currently working with Erindi on a plan to release seven cheetahs into the reserve and they were willing to take an eighth cheetah. Erindi is the perfect release site for Miers as the entire reserve is game fenced meaning that after release Miers would be contained within the reserve (because of the game fence) and therefore would not run the risk of coming into conflict with people or with livestock as Erindi is a reserve entirely dedicated to wildlife. Anytime CCF releases a cheetah, we prefer to use a release protocol called a ‘soft release’. In general, large mammals have a very strong homing instinct meaning that if they are moved or get lost away from where their normal home range is, their homing instinct kicks in and they are easily able to find their way home. So during a translocation (i.e. 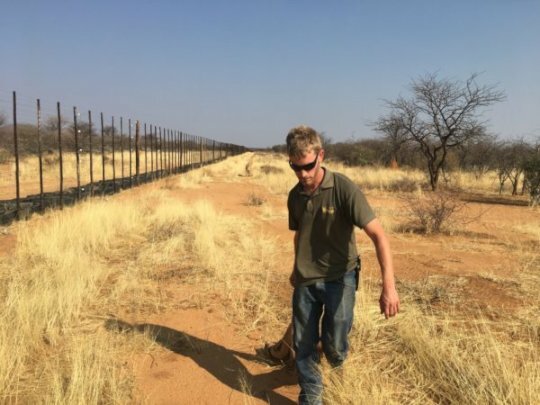 moving an animal from one area to another, for example in Miers’ case from his natural home range where he was captured, to CCF and then to Erindi) large mammals, including cheetahs, tend to leave the intended release site in the attempt to get back ‘home’. If a translocation is taking place there is by default an intended release site that we as managers want the animal to stay within. To reduce the homing instinct and to make it more likely for the translocated animal to stay in the intended release site, before release the animal is held in a boma (i.e. small holding enclosure) within the release site for usually a one to three months. This is called a soft release because the holding time within the release site allows the animal being translocated to acclimate to their new surroundings, and research has shown that this reduces the animal’s homing instinct. Miers was transported to Erindi in August 2018 to begin his soft release in preparation for his actual release at the end of October. 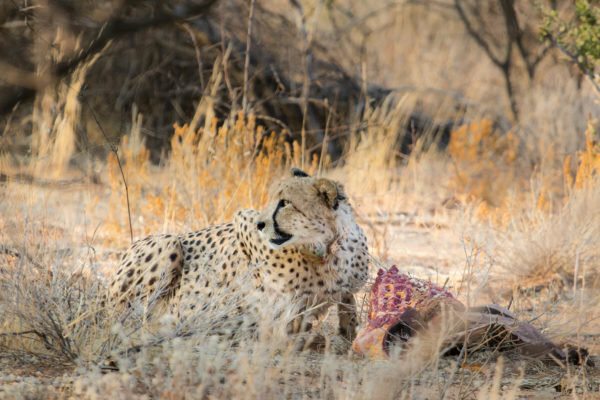 In the afternoon of 26 October 2018, CCF Curator Eli Walker and Erindi Guide Barth Balli released Miers into Erindi by luring him out of his boma with meat, which initiated the post-release monitoring period of Miers’ release. Anytime CCF releases a captive-raised or rehabilitated cheetah back into the while, we are very careful to follow up with that individual very closely for the next few weeks. By doing this, we are able to provide the time necessary for that animal to either learn or re-learn how to be self-sufficient once again. Because Miers was originally captured as an adult, his post-release monitoring period will likely be shorter than normal as he already knows what’s necessary to be self-sufficient in the wild. However, until he’s making regular kills, avoiding other predators, and behaving as we would expect, the team from CCF and Erindi will continue to monitor him very closely. Thus far, Miers’ release has gone very well. He’s very cautious and taking his time to explore Erindi. He’s not made a kill yet as he was so full from his meal during release, but we expect him to make a kill very soon.